Unfortunately, we have been unable to contact Andre but as far as we know the Klein Caledon is recovering after the drought of 2 years ago and is flowing well. On the other hand the Townlands Dam at Clarens has not been restocked as the municipality has not maintained the levels and at times have almost emptied it. 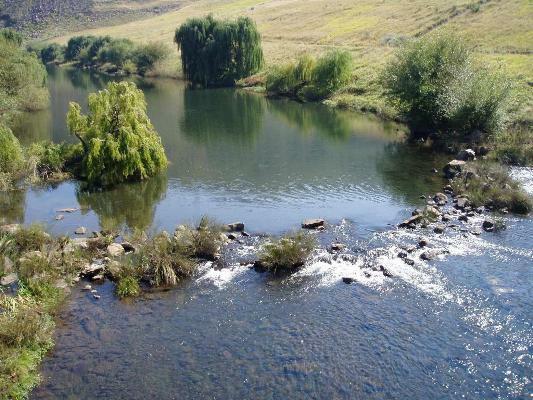 However, there are a number of good flyfishing destinations in the Clarens area. Keith Clover reports that at the Makhangoa Community they have had a good yellowfish season, but the yellows have dropped back into the Katse Dam and trout fishing has come to the fore with the cooler weather. Note that the trout fishing closes at the end of April (an old colonial rule) and the camp reopens in November.